Whether they are made of pork, as is most often the case, or of beef, veal, buck, goat, chamois, venison, sheep, wild boar, or horse, cured meats (salumi in Italian) were born of a need to conserve meat for months after the slaughter of the animal. Salting, smoking, and air-drying are the three processes by which fresh meat is transformed into a long-keeping staple. While all meats are salted, some are smoked, and others are simply air-dried.Italians have been making an amazing array of cured meats for thousands of years using both noble and humble parts of the animals they raise. The ancient Romans prized the spicy pork sausages crafted in the southern region of Basilicata (called Lucania then, and giving rise to sausages named Lucaniche still eaten today). And, fond of intensely tasty foods, they smoked or salted whole pig thighs, yielding savory Prosciutti not unlike those still made in mountain villages across Italy. Two thousand years later, pork remains Italy's favorite meat for curing. Pigs are especially prevalent in areas where there is a notable cheesemaking tradition: after all, wherever there is cheese, there is excess whey, which, combined with bran and corn, becomes perfect feed for pigs. Italian salumi fall under two categories: those obtained from a whole cut of meat, such as a boneless thigh or shoulder (Prosciutto, Pancetta, Coppa, Culatello, and more); and those obtained from minced, ground, or chopped meat that is stuffed into casings, known as insaccati in Italian (salami, sausages, and more). Salumi can range in size from tiny to imposing; they can be delicate or fiercely hot; they can be spreadable or hard; they may be best eaten raw, with a slab of bread, or be meant for cooking. Some are so particular that they are only made in one town or village, virtually unknown elsewhere in the country; others have become famous not only within Italy, but across the ocean. The best place to discover this incredible range of cured meats is the salumeria, Italy's take on the delicatessen. Salumerie across Italy stock the country's most renowned salumi (Prosciutto di Parma, Prosciutto Cotto, Mortadella, Pancetta, Soppressata, and more) and a good number of local specialties; if you head to a salumeria in Trieste (Friuli-Venezia Giulia), you will have a chance to savor different cured meats than if you head to a salumeria in Cagliari (Sardinia). Because many Italian salumi are still cured on an artisanal level, relying on the meat of free-ranging animals or animals raised on specific feed such as chestnuts or corn, they are very flavorful and unique in character. Salumi form an integral part of the Italian regional kitchen. 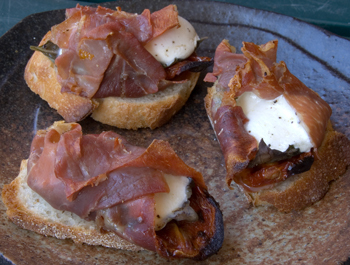 They show up as appetizers in homes and trattorie: served with bread, they make a perfect opener to an informal meal. And while most cured meats arrive at the table unadorned, some (like Bresaola, air-dried beef from Lombardy) are marinated with olive oil, pepper, and perhaps a drizzle of lemon juice. Numerous recipes also call for bits of ham, salami, or other cured meats for added flavor and depth; this is especially true for savory pies, pasta sauces, and long-simmered meat stews. When cooking with cured meats, keep in mind their inherent saltiness, spiciness, and aromatic qualities. Salt, a conserving agent, is used abundantly to ensure that the meat will keep for several months. Similarly, spices play a key role in conserving meat: black pepper, chili flakes, and ground red pepper are predominant, used more or less generously in different places and for different meats; in general, southern Italian salumi are spicier than northern Italian salumi. Fragrant herbs like wild fennel and rosemary also lend flavor to many cured meats, providing an aromatic accent to dishes that incorporate them. Italian salumi can be rather expensive, and you may be wondering whether the domestic versions, which are often cheaper, can be substituted. I heartily recommend using Italian cured meats whenever possible: imported and domestic cured meats cannot be compared, since the animals are raised in different environments on different feed and then cured in different climates. The breed of animal used (hairy black pigs, mountain-roaming wild boar, and so on), the diet of the animal (corn, hay, chestnuts, bran, and more), and the peculiarities of place (salty air from the sea, heavy rainfall, mountain breezes) create cured meats with vastly different characters. Just as Prosciutto di Parma (Emilia-Romagna) tastes different from Prosciutto di Carpegna (the Marches), a ham from Baltimore cannot taste like one from Rome (Latium). Useful link: To purchase a variety of salumi in the United States, visit Citterio. 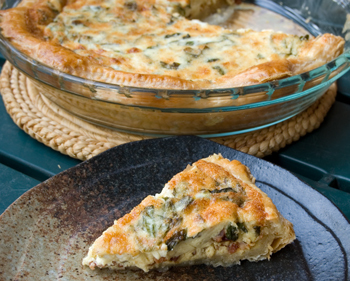 Pancetta, unsmoked Italian bacon, shines in this savory pie. For the pie: Preheat the oven to 400 degrees. Combine all the ingredients except the puff pastry in a bowl. Roll out the puff pastry into a 10-inch square and line an 8-inch square baking dish with it. Prick with a fork and spoon in the Pancetta mixture. Bake 45 minutes, or until the filling is set and the crust is golden and crisp. These delectable little packages can be assembled up to 4 hours prior to serving and refrigerated until you are ready to pop them under the broiler. Make the bruschetta: Preheat the broiler. Line a baking sheet with parchment paper. Place the baguette slices on the parchment paper-lined baking sheet. Place the halved Prosciutto slices on a counter. Top each with 1 basil leaf, then a sliver of sundried tomato, and finally 1 of the bocconcini. Sprinkle with the pepper. Wrap to enclose in the Prosciutto and place 1 bundle on each baguette slice, seam side down. Slip under the preheated broiler until the Prosciutto is crispy, the bocconcini are melted, and the bread is golden at the edges. The Prosciutto for this pie should be sliced thickly, then cubed; that way you will find tentalizing bits of Prosciutto throughout the filling. 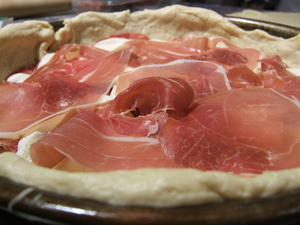 Thinly sliced Prosciutto tends to clump up and form a ball in the filling. Look for phyllo dough in the freezer section of well-stocked supermarkets, and defrost overnight in the refrigerator before assembling the pie. The pie can be prepared (but not baked) up to 12 hours ahead; pour on the custard mixture just before baking. Make the filling: Combine all the ingredients in a bowl. Make the pie: Preheat the oven to 400 degrees. Lightly oil a round 9-inch glass baking dish. Line the baking dish with 1 phyllo sheet and brush very lightly with the olive oil, keeping the other phyllo sheets covered with a dry towel while you work (otherwise the phyllo will dry out and crack, becoming very difficult to work with). Part of the dough will hang over the sides of the pan, which is fine, since you will use it later to encase the filling. 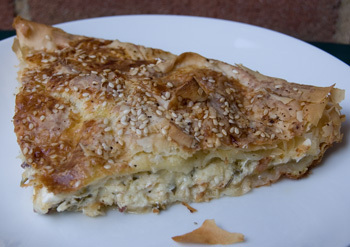 Top with another phyllo sheet, arranging it askew from the first sheet, so the overlapping part falls in another area (not directly on top of where there is already overhanging phyllo); the goal is to form a sort of flower petal shape with the overhanging dough. Continue in this manner, brushing lightly with olive oil and stacking phyllo rectangles slightly askew, until you have used 5 phyllo sheets. Spoon on the filling and spread well, covering the dough. Take the remaining phyllo sheet and cut it in half. Place the two halves on top of the cheese filling, brushing between them with olive oil. 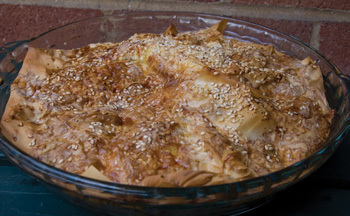 Take the overhanging phyllo dough and fold it in, covering the filling entirely. The dough will look crumpled and creased, and it will not lie flat. That is fine. Sprinkle with the sesame seeds and the pepper. Make the custard mixture: Whisk the ingredients together in a bowl. Pour the custard mixture over the pie. As the pie bakes, the custard will set and create a soft, golden crust. Radicchio's bitterness can be tamed by blanching, a process that also makes it silky tender. Bring 2 quarts of water to a boil. Drop in the radicchio and 1 tablespoon of the salt and cook 2 minutes, or just until the radicchio wilts. Drain and rinse under cool water to stop the cooking. Very gently squeeze out excess water, trying to keep the radicchio halves intact. 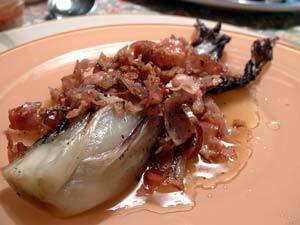 Toss the radicchio with 1 tablespoon of the olive oil, ¼ teaspoon of the salt, and 1/8 teaspoon of the pepper. Grill the radicchio until it is lightly softened and tinged with brown on both sides, turning once, about 3 minutes per side. Transfer to a platter. 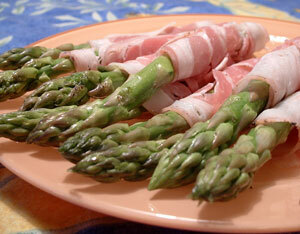 White or green, it doesn’t really matter: whichever asparagus you prefer will be fine in this easy antipasto. Just be sure to select asparagus with tightly closed tips and firm, unblemished stems—the signs of freshness. Avoid very thick asparagus, which wouldn’t have the time to cook all the way through on the grill before the Pancetta burns. Remember to soak the toothpicks in water to cover for 30 minutes before using them to spear the asparagus bundles, or they will catch on fire on the grill. Heat a grill (or a grill pan) to a medium-high flame. Place the asparagus spears on a cutting board with the tips lined up at the top. Cut the asparagus from the bottom so the spears are 4 inches long. On a plate, combine the salt, pepper, and olive oil. Roll the asparagus in the olive oil mixture to coat evenly. Wrap 1 asparagus spear in 1 slice of Pancetta, holding the seam side of the Pancetta closed with one finger. Spear each with a toothpick to prevent unfurling. Proceed in the same manner with the remaining asparagus and Pancetta. I remember family road trips across Italy when I was little, munching on panini stuffed with Mortadella in the back seat as the landscape whizzed by. Even now, whenever I eat Mortadella, I feel as though I'm headed somewhere special, on the road to discovery. Mortadella (a light pink, delicate, cooked sausage that gave rise to America's beloved bologna, for it hails from Bologna in Emilia-Romagna) is typically enjoyed thinly sliced in sandwiches or added to stuffings for pasta. But when thick wedges of it are slow-smoked on the grill, the result is magical. 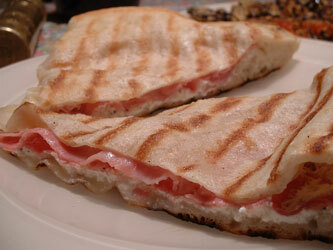 Since Mortadella is so wide, it is impossible to obtain thick slices that weigh any less than ½ pound or so. Yo serve these thick, meaty slices as an antipasto, I suggest you grill them whole, then cut them in eighths before serving. If you grill the Mortadella in wedges, it will dry out. I like to serve grilled Mortadella with a bracing accompaniment like Mostarda di Cremona, a spicy, mustard-laced fruit concoction that is usually paired with rich sausages or boiled meats and is a staple on northern Italian tables for New Year’s celebrations. You will find it in Italian markets and specialty shops. Heat your grill to a medium flame. 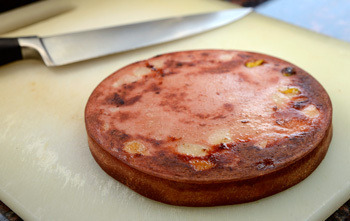 Place the Mortadella medallions as far from the hottest part of the grill as possible; the aim is to slow-cook the Mortadella until it acquires a delicious, smoky scent. Cover the grill in order to smoke the Mortadella; if your grill doesn’t have a cover, drape a sturdy piece of aluminum foil over the Mortadella instead. Cook 10 minutes, or until the Mortadella is lightly browned on the bottom. Uncover and turn. Cover again. Cook until the other side is also lightly browned and the Mortadella has acquired a smoky scent. 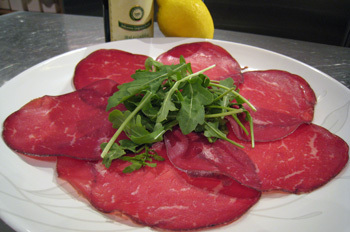 Bresaola is an air-dried, unsmoked beef specialty from the Valtellina area of Lombardy. It is typically served as an appetizer, drizzled with lemon juice, extra-virgin olive oil, and shavings of Parmigiano. Some julienned arugula will only add to the visual appeal, as well as the flavor, of the dish. Arrange the Bresaola in a single layer on each of 4 plates. Opt for an Italian Prosciutto Cotto (literally, "cooked ham"), rather than Prosciutto di Parma (an uncooked ham aged a minimum of 12 months), for this elegant appetizer. Serve with drinks at a holiday gathering or place on the buffet table and let guests help themselves. 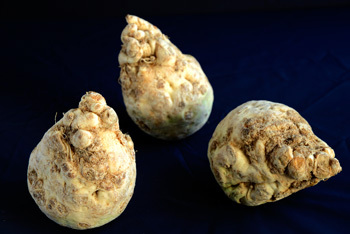 Toss the celery root, mustard, olive oil, salt, and pepper in a bowl; adjust the seasoning if needed. This can be done up to 12 hours ahead (refrigerate until needed). Spread the slices of Prosciutto Cotto out in a single layer on a counter. Divide the celery root mixture evenly over the slices of Prosciutto Cotto and shape into a log along the bottom of each slice. 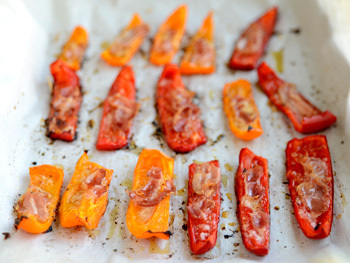 You can use peppers of a single color if you prefer, but the presentation will be prettier with a variety. Avoid green peppers, which are less subtle than red, yellow, or orange ones. If Pancetta (unsmoked bacon) is not available, use bacon instead. Lightly oil an 11-inch x 17-inch baking sheet. Arrange the pepper strips on it with the skin side facing down. Drizzle with the olive oil, sprinkle with the Pecorino, and top with the Pancetta. Season with the pepper. The list below includes both widespread and little-known Italian cured meats. Many of the more obscure cured meats are available only within their zone of production; others have become staples across Italy and the world. Unfortunately, FDA regulations do not allow most of these cured meats to enter North America: only a handful of imported salumi are sold here (Prosciutto di Parma, Prosciutto di San Daniele, Prosciutto di Carpegna, Prosciutto Cotto, Mortadella, and Bresaola). The others are either produced domestically (and therefore taste quite different from the original) or can only be sampled on their native soil. I offer you the exhaustive list below so that, on future trips to Italy, you will know what to sample in each region in the salumerie, in the trattorie, and, should you be so lucky, in people's homes. Sweet-and-sour blood sausage featuring chestnut flour, walnuts, raisins, lard, and nutmeg. Sweet blood pudding with pine nuts, spices, and (sometimes) raisins. A cross between head cheese and sausage. Pork and veal sausage with red wine, aged at least 4 months. Both lean and fatty parts of the pig, including the rind and head, as well as a piece of salted tongue, are used to make this sausage. A blood sausage flavored with mashed potatoes or boiled beets, lard, and spices; boiled, then sliced and baked with potatoes and butter. Made in the Valtellina from prized cuts of beef (or, more rarely, horse) which are salted and spiced, then hung to dry; sometimes smoked. Bresaola flavored with white wine, cinnamon, cloves, thyme, rosemary, bay leaves, and sugar. Salami made from pork and Bresaola trimmings. The Little Hunter's Sausage; small salami created for hunters who needed a quick energy fix on the hunt. Pork shoulder and neck stuffed into pork bladder, amply spiced; sometimes smoked or conserved in olive oil or flavored with cooked wine. Pork forcemeat enclosed in pork rind, boiled before serving. Salted chunks of meat; conserved for months in a savory brine. "Salted Meat," made by marinating beef in a salt brine with pepper, garlic, bay leaves, rosemary, juniper berries, and white wine for 20 days. Sausage flavored with white wine and chili. Salami made from lean and fat meat, cut with a knife and spiced with chili. A soft, spreadable pâté-like smoked pork sausage, often spiked with garlic and vino cotto. Smoked sausage featuring the lowly but economical turnip. A specialty of Piacenza, made from the top part of the pig's neck, which is dry-salted, spiced, stuffed into casings, air-dried, and aged for 6 months. Boiled salami made from humble parts of the pig, spiced with cinnamon and nutmeg, studded with pistachios. Dried salami-like bars of wild boar or beef from the Maremma. Initially made of horse and now of pork, these strips of spiced and seasoned meat are sold coupled, hanging from a string. Cremona's famous pork sausage, typically boiled and served with lentils to ring in the New Year; artisanal producers still flavor the forcemeat with vanilla. This rich sausage needs to be slowly simmered for hours. Made according to a secret recipe, this thick boiled sausage is generously seasoned with cloves, nutmeg, cinnamon, and black pepper. Sausage from the Valtellina;, best poached in the water used for boiling chestnuts. Made from the most prized portion of the ham, the "heart of Prosciutto," pear-shaped Culatello is rubbed with wine and pepper, aged in well-ventilated rooms for 10 months to 1 year, and delicate in flavor. Pork liver in casings; flavored with honey. Pork liver in casings; flavored with chili. "The Kissed Filet," a soft salami wrapped around a cured pork filet. An imposing salami spiced with wild fennel seeds (finocchio selvatico in Italian), aged 6 months to 1 year. The meat from the cheek and throat of a pig is salted, rubbed with pepper, and aged; less fatty than Pancetta, which is made from the belly of a pig, it is cooked in pasta sauces, with vegetables, and more. Sausage slowly smoked over the fireplace in homes. 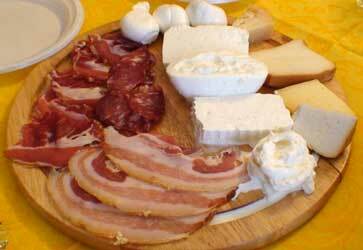 Smoked, salted, or spiced lard, eaten as an antipasto. Subtle lard, especially delicious when perfumed with rosemary. Lard aged near marble quarries in the town of Colonnata, placed in a salt brine in marble tubs after being rubbed with spices. Eaten raw on bread and focaccia. A creamy, pearl-colored lard from the town of Saint Arnad; best eaten thinly sliced with whole wheat bread slathered with mountain honey. Sausage from the shoulder and neck of the pig; spiced, salted, and hung to dry, aged for a minimum of 2 months. Called Capocollo elsewhere. Sausage praised by Cicero and Martial in the days of ancient Rome, flavored with sweet and spicy pepper, fennel seeds, and black pepper; eaten grilled or roasted, or raw if smoked. Treviso's famed pork sausage, whose recipe was codified in 1300. Some is made with pounded Pancetta and a mixture of pepper, cinnamon, cloves, nutmeg, mace, and coriander; another is enriched with chicken livers. Sausage made from the innards, spleen, and fat of the pig; sliced and fried in butter, it is served alongside pasta or frittatas. Oddly named garlic- and wine-laced blood sausage made near Novara. Salted and aged boneless leg of goat, chamois, or beef; it was once made with wild mountain goats, but they have become a protected species. Similar to Bresaola. The real "baloney, whose recipe was developed during the Middle Ages. The real Bolognese version calls only for pork; pistachios, garlic, or truffles are sometimes added for flavor. Finely ground sausage threaded with a wide strip of lard; also called Coglioni di Mulo ("Mule's Balls"). Sausage featuring pork liver, beef or pork, and white wine or reduced Barbera wine; smoked or unsmoked, meant for boiling. Sausage spiced with black pepper; aged a little over 1 month. Sausages of finely ground pork threaded with a thick strip of lard; smoked and aged up to 3 months. Minced pork sausage that finds its most elaborate expression in Val di Sole, where it is sprinkled with cornmeal, pressed, and smoked over beechwood and aromatic herbs. Savory salami best eaten in thick slices; good grilled. Molise's version of Capocollo or Coppa, spiced with chili rather than black pepper. Sausage reminiscent of Cotechino, made from lean and fatty pork meat and usually boiled and eaten with brovade. Pork meat, lard, liver, and lights are ground together and stuffed into pig's bowels, then spiced with chili and aged up to 1 year; eaten as an antipasto, spread on bread, and incorporated in pasta sauces. Small pork chops coated with a chili pepper and garlic paste, roasted, then rubbed with salt and vinegar. Fatty meat from the pig's belly, shaped in rectangles or coiled. Essentially it is unsmoked bacon; it is served raw as an antipasto or cooked in numerous dishes. Meatballs from the Alta Carnia, macerated with juniper and other mountain herbs, rolled in cornmeal, smoked, and aged. Spit-roasted pork flavored with garlic, pepper, and wild fennel. The Italian version of Germany's Frankfurterwürstel, a pork and veal sausage that is stuffed into a mutton casing and smoked over birchwood. Smoked hams rubbed with wine and chili. Pig thighs are salted, pressed lightly, and aged to yield a slightly compact ham. Baked ham; large thighs are deboned, then cured in a salt brine, massaged, baked, and marketed without curing. Gorizia's ham is wrapped in bread dough and baked until the crust is golden and crisp, then eaten warm or hot, with grated horseradish at Easter. Made from the thigh of a "hybrid" pig (born from the union of a sow and a wild boar); the meat is as flavorful as its father's, and as moist as its mother's, yielding especially succulent hams. Ham that benefits from the fresh mountain breeze of the Gran Sasso; flavored with chili and aged 1 year. Ham rubbed with a mixture of white wine, garlic, and pepper, aged at least 1 year. A ham produced in a small village by the same name on an artisanal level. Ham made in the town of Carpegna since the days of ancient Rome; deep pink, with a delicate, sweet flavor, it is salted and aged 14 months. An intensely flavorful ham made usually sold with the bristle still on and the hoof still intact. Hams flavored with red wine, lard, chili, and spices; aged up to 16 months. Smoked, chili-laced ham from a mountain village in Alto Sannio. Salted ham flavored with aromatic herbs. This ham is the ultimate symbol of its region's gastronomy. Round in shape, it is salty yet delicately sweet and aged from 10 to 12 months. The rosy and sweet ham of San Daniele is aged from 15 to 18 months; it is sweeter than the ham from Parma, and is easily recognizable since it is worked with the hoof still attached. Smoked ham from the village of Sauris in the Alta Carnia, produced at an altitude of 4,000 feet; aged from 12 to 18 months. Ham aged 40 days, smoked over juniper wood. Ham made from small pigs raised in the mountains; cured artisanally, spiced with chili, and aged 15 months. Ham from the province of Rome. Tuscan ham, smaller and saltier than that from Parma and San Daniele; best cut by hand with a sharp knife. Smoked beef, most often served thinly sliced as an antipasto or as part of a Bollito Misto. A specialty of Ferrara made with pork meat, tongue, head, liver, cloves, cinnamon, red wine, and brandy, Marsala, or rum; it becomes almost creamy and releases a rich ragù-like sauce when pierced as it cooks. Salami made from the meat of black pigs, spiced with whole black peppercorns. Salami named after the glass vase in which the it is layered with pork fat to protect it from humidity and to age. Salami made from the wild boars that roam Umbria's woods. Salami made from prized cuts of pork, belly fat, salt, crushed garlic, and red wine; aged 6 months. Salami featuring knife-cut (rather than ground) pork; aged from 2 to 5 months. This salami features top-quality ground pork, Pancetta, ground black pepper, and white peppercorns; as it ages for 3 months, it becomes covered with its characteristic white mold. Rare salami from Anversa degli Abruzzi; sweet and delicate. Subtle salami flavored with black pepper and garlic. Goose salami from Mortara, for eating raw or poaching. Salami made from coarsely ground meat; spiked with white wine. Pork salami laced with cheese and saffron; aged 3 months. Smoked salami flavored with orange zest and garlic steeped in wine; sometimes conserved in olive oil or under ashes. Salami that is sometimes flavored with garlic. Sausage, usually obtained from the shoulder, spiced with chili or red pepper, aged a minimum of 1 month, and braided. Spiced sausage, eaten raw, sautéed, or grilled. Sausages sometimes conserved in olive oil. Sausage made from pork lights, especially in Apice. Fennel-flavored sausage conserved under a layer of fat. Sausage made from minced pork scraps (head, cheek, lights, liver, and nerves), generously spiced and flavored with garlic; grilled and eaten on toasted bread, in soups, or over polenta. Sausage made from coarsely ground pork shoulder and belly; it is flavored with salt, pepper, and garlic, with the possible addition of chili and other spices, then stuffed into a casing, formed into a horseshoe shape, and aged at least 3 weeks. Sometimes smoked, it is grilled when fairly young or eaten raw when aged long enough. Cooked sausage that may include pork liver. Pork blood sausage featuring sugar, raisins, herbs like thyme and mint, Pecorino, chopped boiled chard, and more. Often spread on pane carasau, because they are soft even after boiling. Blood pudding scented with raisins, orange zest, parsley, chili, and garlic. Loin flavored with garlic and pepper; tied like a salami and aged. Humble salami that makes use of all the parts of the pig that couldn't be incorporated in other preparations, including the skin and cheeks. Ground pork salami flavored with garlic steeped in red wine, aged 1 year; potatoes and chestnuts form the basis of the diet of pigs raised on the slopes of the Pasubio, so their meat acquires an unmistakable taste. Salami from lean pork meat and pork fat (preferably from small black pigs). The meat is cut by knife rather than ground, then spiced, stuffed into casings, and pressed under a weight to obtain its characteristic flattened shape (hence the name). Traditionally hung near the hearth to age and acquire a delicate smoky aroma. Sometimes conserved in olive oil or lard; may contain pork blood or ground sweet peppers for a brighter red color. Salami made of finely ground lean meat and strips of lard;, dried over a fire 3 to 4 days. Noble and humble cuts of pork, including the head and cartilage, are ground, spiced, stuffed into casings, and pressed under weights, then hung to age. Rosy smoked ham made from the best pig thighs which are dry-salted and aged from 5 to 6 months. Square smoked ham made from the best parts of the back of the pig, which are hung to smoke over beech and juniper wood. Blood sausage flavored with mint and Pecorino. Often spread on pane carasau, because they are soft even after boiling. Delicately flavored, fatty head cheese. Salted cow udder flavored with sage and garlic, aged briefly. Spreadable pork sausage similar to Ciauscolo; flavored with chili. Pork salami spiced with chili and wild fennel; aged at least 3 months. This ham earned its name because of the way it is held against the shoulder as it is sliced. Pork meat, head, and rind stuffed into the skin of the pig's hoof; a specialty of Modena.